Primula prevernalis F. H. Chen & C. M. Hu, Fl. Reipubl. Popularis Sin. 59(2): 291. 1990. Type specimen: C.W. Wang 89751 (holo. ), C.W. Wang 90473 resides at Kunming Institute of Botany, Kunming, Yunnan and Northwestern Institute of Botany , Yangling, Shaanxi (specimen WUK 273494). Epithet: Named for its early blooming period in Spring. Little is known of this species as there are few collections. 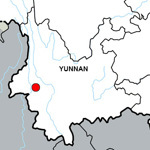 It is endemic to the Yunlong Xian in W Yunnan but this area is not ferquented so the possibility is that the range could be extended. The description compares it to Primula irregularis. Flowers are purple on very short scapes of 10-20 with yellow farinose bracts, pedicels and calyx. The calyx is parted to 2/3 and is pointed at the apex. The 2-cleft flowers are slightly hairy around the mouth. Leaves are obovate to oblong, tapering to the base, minutely glandular and with a hydathode-denticluate margin. If you have an image of this species, please contact the webmaster.